VirnetX Inc. v. Cisco Systems, Inc., et. al., 6-10-cv-00417 (TXED February 26, 2013, Order) (Davis, J.). The court denied defendant's motion for summary judgment on its indefiniteness defense as to plaintiff's retroreflective sheeting patent. "The Court construed the claim term 'varied/vary in opposition' as follows: 'to intentionally provide within a given cube corner element a 1‐2 dihedral angle error and a 1‐3 dihedral error that are different in magnitude and/or sign.' The Court also construed 'nominally parallel' as follows: 'no purposeful variation from parallel using a groove‐forming machine with a degree of precision of at least ¼ arc minute.' [Defendant] argues that as these terms have been construed to include an intent or purpose requirement, a person of ordinary skill in the art cannot independently conclude that a particular piece of retroreflective sheeting, article or lamina infringes because such analysis requires a determination of the subjective intent of the person who made such sheeting, article or lamina. . . . The Court finds that there is no binding authority for the position that an apparatus claim may not include an intent element. . . . [Plaintiff] has demonstrated that a person of ordinary skill in the art can determine the scope of those claims that include an intent requirement by reviewing internal design documents or through witness testimony." 3M Company, et. al. v. Avery Dennison Corporation, 0-10-cv-02630 (MND February 25, 2013, Order) (Davis, J.). The court denied defendant's motion to dismiss plaintiff's induced infringement claim and rejected defendant's argument that it could not be liable for its pre-Akamai Techs., Inc. v. Limelight Networks, Inc., 692 F.3d 1301 (Fed. Cir. 2012), conduct. "[Defendant] pointed out that, before the Federal Circuit issued its decision in Akamai, a defendant . . . who induced another to perform fewer than all of the steps of a method patent could not be held liable for induced infringement. Accordingly, [defendant] argued, it could not have intended to induce infringement before Akamai because it was legally impossible for it to be held liable for inducing a customer to perform only one of the steps of the [patent-in-suit]. . . . [T]he most natural reading of Akamai . . . is that liability for induced infringement requires, not that the defendant knew that its acts would render it legally liable (which would have been impossible pre-Akamai), but rather that the defendant knew and intended that (1) each of the steps that make up the method patent would be performed by someone (either the defendant itself or someone acting at the behest of the defendant) and that (2) these steps would, if performed by a single entity, constitute direct infringement (which is possible both pre- and post-Akamai)." Transunion Intelligence LLC, et. al. v Search America Inc., et. al., 0-11-cv-01075 (MND February 22, 2013, Order) (Schiltz, J.). The court sustained defendant's objection to the magistrate judge's recommendation that the Rule 11 sanctions imposed against plaintiff did not extend to plaintiff's motion to reconsider the Rule 11 sanctions award. "I agree with [defendant] that it should not have had to file a second and separate motion for sanctions in connection with the reconsideration motion in order to recover attorneys' fees incurred in connection with opposing the sanctions motion. . . . The motion for reconsideration was itself frivolous. . . . [Plaintiff's] decision to seek reconsideration of the court's decision on the sanctions motion caused this court to waste even more time, and [defendant] to waste even more money, than had already been wasted in supervising and defending against this lawsuit. . . . Accordingly . . . the court awards an additional $12,745.35 in sanctions incurred in connection with the motion for reconsideration." Source Vagabond Systems, Ltd. v. Hydrapak, Inc., 1-11-cv-05379 (NYSD February 21, 2013, Order) (McMahon, J.). The court denied plaintiff's motion to compel thirty defendants to produce their entire source code trees for each accused instrumentality and rejected plaintiff's argument that defendants exaggerated the burden of producing the entire trees. "The e-commerce systems at issue here are complex and involve different types of source code, computer languages, hardware systems, operating systems, third party interfaces, applications and data under third parties’ control. . . . More efficient than producing an entire source code tree, Defendants’ expert advocates to have Defendants’ technical employees – who are intimately familiar with their own source code – 'identify and provide the portions of source code that specifically relate to the aspects or functionality identified by the plaintiff in its infringement contentions.'. . . To the extent that [plaintiff's] PLR 3.1(c) charts identify any particular aspects or elements of a Defendant’s system that relate to source code, the court orders that the Defendant is only required to produce the source code that is 'sufficient to show the operation of' those system aspects identified in [plaintiff's] PLR 3.1(c) charts." Ameranth, Inc. v. Pizza Hut, Inc., et. al., 3-11-cv-01810 (CASD February 20, 2013, Order) (Stormes, M.J.). Bird-B-Gone Inc. v. Bird Barrier America Inc., et. al., 8-12-cv-00178 (CACD February 15, 2013, Order) (Guilford, J.). Following a bench trial, the court found that plaintiff's hepatitis drug patent was invalid as obvious even though defendant admitted to copying. "While some cases have declared that copying can be a forceful secondary consideration of nonobviousness in ANDA cases . . . this Court has concluded that in the Hatch-Waxman context, 'a showing of copying . . . is not compelling evidence [of nonobviousness].' Although [plaintiff] suggests that copying should be given more weight here since there were a number of other FDA-approved drugs to treat hepatitis B that [defendant] could have copied, at least one district court . . . has rejected copying as a compelling consideration in an ANDA case, even where the defendant could have chosen to copy another drug in the relevant market. . . . [I]n light of the incentive provided by the Hatch-Waxman Act for a company like [defendant] to copy entecavir, the force of that bare choice is diminished, as compared to what it might suggest in an industry without such a regulatory scheme." Bristol-Myers Squibb Company v. Teva Pharmaceuticals USA Inc., et. al., 1-10-cv-00805 (DED February 11, 2013, Order) (Burke, M.J.). Thermolife International, LLC v. Better Body Sports, LLC, et. al., 2-12-cv-09229 (CACD February 13, 2013, Order) (Feess, J.). The court denied defendant's motion to transfer venue from the District of Delaware to the Northern District of Texas and rejected defendant's argument that plaintiff's choice of forum was entitled to less deference because plaintiff was a "litigation vehicle." "[P]laintiffs (as the injured parties) have historically been accorded the privilege of choosing the venue for pursuing their claims. [Defendant] argues that these customary principles 'should be accorded little weight because [plaintiff's] recent incorporation in Delaware is an artifice of litigation' and, indeed, [plaintiff] is 'simply a litigation vehicle . . . designed to give [a corporate affiliate] an anchor, however tenuous, to this District.' . . . [M]any businesses and academic institutions enforce their patent rights through private companies (like [plaintiff]); such a business strategy is not nefarious. The court declines to treat such non-practicing entities as anything less than holders of constitutionally protected property rights, those rights having been legitimized by the [PTO]. Therefore, the fact that a plaintiff is characterized as a 'litigation vehicle' does not detract from the weight accorded a plaintiff's choice of forum." Cradle IP LLC v. Texas Instruments, Inc., 1-11-cv-01254 (DED February 13, 2013, Order) (Robinson, J.). The court denied defendants' alternative motion to modify a permanent injunction to include a four-week sunset provision. "[Defendants'] executives have indicated to the press that the design-arounds to the infringing features are already in place and the injunction will not disrupt [their] shipment of product. . . . In light of the time that has already passed from the issuance of the injunction and [defendants'] public representations that it had already completed design-arounds, the court also denies [defendants'] request for a four-week sunset provision." Brocade Communications Systems, Inc., et. al. v. A10 Networks, Inc., et. al., 5-10-cv-03428 (CAND February 12, 2013, Order) (Grewal, M.J.). Smart Options, LLC v. Jump Rope, Inc., 1-12-cv-02498 (ILND February 11, 2013, Order) (St. Eve, J.). The court denied defendant's motion to dismiss plaintiff's infringement action for improper joinder and rejected defendant's argument that the defendants were competitors. "[Plaintiff] accuses [the moving defendant's] products that allegedly functionally integrate [the other defendants' chips] of infringement. Put simply, on this allegation, we are not talking about similar products as was the case in Motorola Mobility, we are talking about the same product — [the moving defendant's] accused product that functionally integrates [the other defendants' chips]. The Court finds that this allegation, taken as true, satisfies the 'same product' prong of the AIA joinder standard." US Ethernet Innovations, LLC v. Samsung Electronics Co., Ltd., et. al., 6-12-cv-00398 (TXED February 6, 2013, Order) (Love, M.J.). The court denied in part defendant's motion in limine to exclude customer product reviews on the internet. "Motion to exclude customer product reviews appearing on the internet to establish actual use of the infringing feature of [defendant's] accused products, on hearsay grounds, is denied with respect to customer comments, provided that Plaintiffs lay a proper foundation and the comments are not offered for their truth of the matters asserted. [Defendant] may request a limiting instruction as to the use of these comments only to show customer use. Plaintiffs may seek permission at trial to use the comments for impeachment purposes, depending upon the evidence presented by [defendant]. The motion is granted with respect to introduction of 'sorting' information to show popularity of the infringing feature." ABT Systems, LLC, et. al. v. Emerson Climate Technologies, Inc., et. al., 4-11-cv-00374 (MOED February 7, 2013, Order) (Fleissig, J.). The court denied defendant's request to substitute a new expert two weeks before trial due to the Federal Circuit's determination in a related case that the expert had "prevaricated." "[Defendant] cites no case and the Court finds no support for substitution of an expert because that expert's veracity has been called into question. . . . Moreover, it is not apparent . . . that [defendant] is without fault in this matter. By [defendant's] own admission, two courts have previously rejected [the expert's] testimony on credibility grounds. . . . [Defendant's expert's] testimony is crucial to a key dispute in this action. . . . [P]ermitting [defendant] to substitute its expert would cut at the core of this action, requiring additional depositions and a likely delay of trial." Gilead Sciences, Inc., v. Teva Pharmaceuticals USA, Inc., et. al., 1-10-cv-01796 (NYSD February 6, 2013, Order) (Sullivan, J.). The court granted defendants' motion to stay six of plaintiff's infringement actions pending post-grant review of business methods (CBM) under Section 18 of the America Invents Act because the potential simplification of issues lightly favored a stay, the stage of the litigation strongly favored a stay, and the lack of undue prejudice and a reduction of the burden of litigation favored a stay. "Section 18 of the AlA adds a fourth factor to the traditional stay analysis, instructing the court to consider 'whether a stay, or the denial thereof, will reduce the burden of litigation on the parties and on the court.' . . . It appears the intent of this provision was to ensure that district courts would grant stays pending CBM review proceedings at a higher rate than they have allowed stays pending ex parte reexaminations. . . . [T]hese actions are 'still at the earliest possible stage. No conferences with the [c]ourt have occurred; no schedules have been set.'. . . . [N]either the timing of the CBM review petition nor the timing of the stay request suggest any inappropriate dilatory motive on the defendants' part. The petition was filed . . . less than one month after the review program went into effect, and the motion to stay was filed [three weeks later]. . . . There is no evidence . . . that [plaintiff] directly competes with any of the defendants' accused products, and its own responsive brief indicates that, at this point, patent infringement litigation represents its primary business. As such, this consideration does not suggest that a stay would cause [plaintiff] undue prejudice." Markets-Alert Pty Ltd. v. Bloomberg Finance LP, et. al., 1-12-cv-00780 (DED February 5, 2013, Order) (Sleet, J.). ArrivalStar S.A., et. al. v. Meitek Inc., et. al., 2-12-cv-01225 (CACD January 28, 2013, Order) (Selna, J.). The court granted defendants more than $12 million in attorneys' fees under 35 U.S.C. § 285 following summary judgment on plaintiffs' correction of inventorship claim. "Plaintiffs could not have reasonably expected success on the merits of the patent claims without knowing the identity of the allegedly omitted inventors. . . . The Court is particularly struck by Plaintiffs’ decision to pursue their claims further following [the court's] warning that the case would likely be found exceptional based on the evidence before him at the bond hearing. Plaintiffs nevertheless continued with their claims despite [the court's] clear indication that there was a serious lack of evidence regarding Plaintiffs’ patent claims." Gabriel Technologies, et. al. v. Qualcomm Incorporated, et. al., 3-08-cv-01992 (CASD February 1, 2013, Order) (Battaglia, J.). The court denied in part defendants' motion for database costs. "The evolving caselaw is divided on whether, or if so, under what circumstances, database costs ["host[ing] electronic documents . . . data management and indexing, data restoration, discovery support, and microfilm and VHS conversion"] are compensable under Section 1920. . . .This Court concludes that [defendant's] database hosting costs, separate from .TIFF and OCR conversion, Bates stamping, load file and other physical media generation, are non-compensable . . . . The Court recognizes that policy reasons could support a different outcome here, where, as is often true in litigation today, certain pre-production collection and conversion tasks were the necessary preliminary steps for the eventual production of documents in the electronic format agreed upon by the parties. However, similar to the need in the paper-document era for members of the litigation team to gather and organize boxes of documents in warehouses for review and production, the fact that preliminary tasks related to organizing and maintaining electronic data are necessary does not make them taxable under Section 1920." Alzheimer's Institute of America v. Elan Corporation PLC, et. al., 3-10-cv-00482 (CAND January 31, 2013, Order) (Laporte, M.J.). The court granted two defendants' motion to sever and transfer venue from the Central District of California to the Northern District of Illinois and rejected the argument that pretrial joinder weighed against transfer. 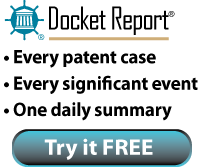 "[T]he Court finds persuasive a recent decision stating that: where the plaintiff initiates patent infringement litigation against multiple, unrelated defendants located in different districts, the problem of litigating in multiple forums can be one of its own making. . . . [P]atent holders who sue multiple defendants located in different districts, for different allegedly infringing products, may encounter the cost of multiple law suits in different forums. . . . To the extent that the Court issued an order joining the parties for discovery and pretrial purposes, it reflects a case management strategy to promote judicial efficiency and bears little on whether the cases could or should be consolidated for trial under section 299(a)(1). Thus, the fact that the Court joined these cases for pre-trial purposes does not weigh in favor of keeping these cases together." Secured Mail Solutions LLC v. Advanced Image Direct LLC, et. al., 8-12-cv-01090 (CACD January 30, 2013, Order) (Carter, J. ).